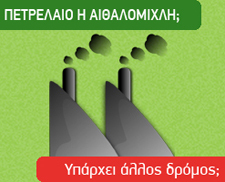 The Ecologist Greens (Greek: Οικολόγοι Πράσινοι, Oikologoi Prasinoi) are a Greek Green ecologist political party. It has existed since 2002, yet the ecologist movement in Greece dates many years and was characterised by a reluctance to actively become involved in the political scene. They are a member of the European Green party. The Ecological Forum, the body that lead to the establishment of the party, was founded after a proposal of the local group Ecological Movement of Thessaloniki (Greek: Οικολογική Κίνηση Θεσσαλονίκης, Oikologiki Kinisi Thessalonikis), and brought together members of the organization «Green Politics» (Greek: Πράσινη Πολιτική, Prasini Politiki), the previous Greek member of the European Green Party, with other local ecological groups and independent ecologists. On 7-8 December 2002, the Eco Forum called for a conference that convened in the building of the Athens Lawyer Association, and it decided to establish the Green Ecologists and elected a 18 member council to coordinate the establishment of a new political entity. In the coming months, focus groups were created to shape the constitution and the political positions of the body, which were adopted by the first congress of the party in May 2003 at Panteion University. 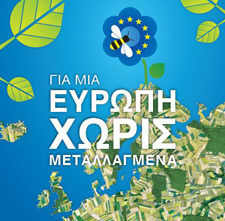 In the prefectural elections of 2006, the Greens supported 2 combinations, the «Eco-Athens» in the municipality of Athens, that took 1.4% of the votes and «Ecology Solidarity» that won 4.6% and acquired 2 seats on the Departmental Council in the prefecture of Thessaloniki, as well as 53 other municipal and County sets in rest of the country. At its 5th Congress in March 2007, the party decided to contest the 2007 Greek legislative election. Nanos Valaoritis, a distinguished living Greek poet, became the party’s leading candidate in the 2007 Greek legislative election. The inclusion of additional artist candidates (such as sculptors, painters) indicate that the party enjoys some support among the Greek art community. During 29 & 30 of March 2008 the annual congress of the party took place in Athens at the Gini building of the National Technical University of Athens (NTUA). The annual congress is the highest political entity of the party and was attended by a record of 235 members. Members of the party are recently (September 2008) reaching 700. With the 2007 Greek legislative election, its first general election, the party became the sixth largest party in Greece and the largest party without parliamentary representation. In the December 6-7-8 Party General Assebly it was decided to contest the 2009 summer European Elections and the list of party candidates was elected. The Ecologist Greens managed to elect an MEP in the European Elections of June 2009, but they narrowly failed to gain representation in the national elections that followed in October 2009. Nevertheless, their share of the vote increased to 2.53% gaining approximately 100,000 more votes than in the 2007 Greek legislative election. After six years of recession and damages to the economy that many compare to a defeat after a war, Antonis Samaras, the Greek prime minister, called for early elections for President of the Hellenic Republic in December. Stavros Dimas, the candidate of the ruling coalition of the New Democracy party (ND.-conservatives) and of the Panhellenic Socialist Movement (PASOK – the social democrats), is a respected politician and a former minister, Environment Commissioner and current vice – President of ND He is a typical product of the Greek political system, as is his own son who “inherited” his father’s seat in the Parliament in the region of Corinth. Yet Dimas’ profile was inadequate to attract the magic number of 180 MPs needed out of 300, given the fact that together ND and PASOK had 155 MPs in the Greek Parliament and that are around 25 independent MPs. Rumors had it that millions of euros were offered to ‘undecided’ MPs in order to have a new President elected and avoid early parliamentary elections that could jeopardise many MPs desired reelection. This is yet another sign of a deeply sick democracy. After failing to win the required number of votes to stave off early elections, we now know that there will be parliamentary elections on January 25, 2015. The new Parliament will have to elect the new President with the support of at least 151 MPs this time, according to the Greek constitution. Indeed, while the constitution places little importance on the presidency as an institution with actual powers, similar manipulation of presidential elections as a political tool for early parliamentary elections had occurred in the past. This time though, things seem different. The traditional two-party ‘game’ between ND and PASOK now seems a memory of the past. Samaras’ ND doesn’t score higher than 25% in polls, while Venizelos’ PASOK will struggle to pass the 3% threshold to gain seats in the parliament. George Papandreou, former prime minister in the beginning of the crisis and former president of PASOK, created his own political party, the Movement of Democrats and Socialists KI.DI.SO., and this will definitely make things more difficult for the so-called center-Left. Polls show that the radical Left party, SYRIZA – and its allies, among which are the Ecologists Greens, the Greek green party – is close to a record high result that might result in the first ever radical Left government in the country. Orchestrated waves of fear seem to have been unleashed in Greece, Europe and the rest of the world surrounding such a possibility. Cold War-type arguments are mixed with today’s existing or imagined fears about political instability. Will the markets “allow” for maneuvering? Will the current leadership in the EU discuss and perhaps reach a deal with a Greek government of the radical Left? Will such a deal not only benefit the Greek debtors and the banks but the hundreds of thousands of everyday citizens? Greeks have not abandoned mainstream political parties because of political blindness but because of their government and the Troika’s initiatives that have destroyed their lives and killed their future. All those who have been observing Greece in recent times should be looking for the reasons behind political behavior of citizens and not metaphysical or stereotypical explanations that bring us decades back in political thinking. Readers must understand that catastrophe has already happened in Greece and that the radical Left has never ruled the country, with an exception of some months in a coalition government with ND in the late 1980s. The over 1.2 million unemployed or the almost 200,000 mostly younger Greeks who have migrated largely to Germany are just two pieces in a puzzle that constitutes a humanitarian disaster. The desire of the current leadership in the EU – ‘Angela and friends’ – to go on with austerity and apply a by-and-large punitive approach translates into more poverty and even less positive feelings for our European project. The electoral strategy of the government and of its allies seems to lack imagination. This strategy tastes like “used gum”, no sugar, no taste, no hope. The radical Left might not a have a clear answer to the problems but it sounds like a bad joke when it’s unleashed as a criticism from the side of those who designed, executed and still insist on the value of the current austerity programs throughout Europe. Let us not forget that similar processes of political radicalization is taking place in other austerity stricken EU Member States, most of which are among the Troika’s “success stories” (see the Podemos party in Spain). What is at stake though in the upcoming national elections in Greece? Why is there such an orchestrated attack on SYRIZA? Is Hannibal really “ante portas” or is “Peter” once again screaming out about the coming wolves? In the final analysis who is ‘the wolf’? Greece has been in intensive care for years. As expected, numbers seem to have improved but this says little to those who look for food through leftovers. The arrival of ‘development’ in a country in ruins has been the most popular joke in Greece. At the same time Greek public debt is higher than at the beginning of the crisis. Greek millionaires still evade taxes and find a safe heaven for their tangible and intangible wealth in Swiss, Luxembourgian, or Cayman Islands’ banks. Greek ship owners might love summer time in the Greek islands but still prefer Panamanian or Liberian flags for their vessels. Whether one likes it of not, austerity has touched very few – if any – of those who benefited greatly during the ‘good old times’. At the same time everyone now understands that being reminiscent about the recent unsustainable past is not enough to feed children or warm up homes. There is a structural difference between SYRIZA and the government. The former talks in terms of justice while the latter acts in terms of injustice. SYRIZA places importance on citizens while the government focuses on presenting numbers and tables to the Troika. SYRIZA points out to the destruction of the social fabric in Greece and Southern Europe at large, while the government seems to be satisfied by positive comments made by Mr. Schaeuble or Mr. Fuchtel, Minister of the German Federal Republic government for…Greek Affairs. The last post, that of ‘Greek Affairs’, must be the most recent addition to the history of neocolonialism. Keep in mind that emotions run high in this part of the world and I can’t see why Greeks should abandon being emotional, given the fact that Germany still owes compensation to Greece from the World War II period. One needs to free him or herself from the dominant mindset if s/he wishes to understand realities away from his/her own country. We all need to realise that we have been indoctrinated by neoliberalism and its unchallenged ‘truths’. We all need to pay attention to the media with skepticism, as most of them are in the hands of those who benefit from austerity, of those who profit from the pain, destitution and insecurity of others. What about green political thinking in Greece? Is there space for green ideas in a country that desperately seeks ‘growth at any cost’? Could Ecologists Greens, a member party of EGP, run in the upcoming elections on their own? Should Greens in Greece form alliances and if yes, with which political parties? Should the Ecologists Greens consider inviting splinter groups? Would unlimited personal ambition – as it has been exhibited in the recent past – prevail once again in Greek Green politics? Would Greek Greens perceive the possibility of a radical Left government as an opportunity to put forward a Green agenda or would they place more emphasis on existing differences between the two political forces? These were some of the questions which accompanied Greek Greens, as they convened for their electoral conference in which they decided with an overwhelming majority of above 60% on Sunday, January 4, 2015 to participate in the upcoming elections with green candidates in the electoral list of SYRIZA. Reds will not turn automatically to green, and nor will all greens shift into red – that’s the agreement. 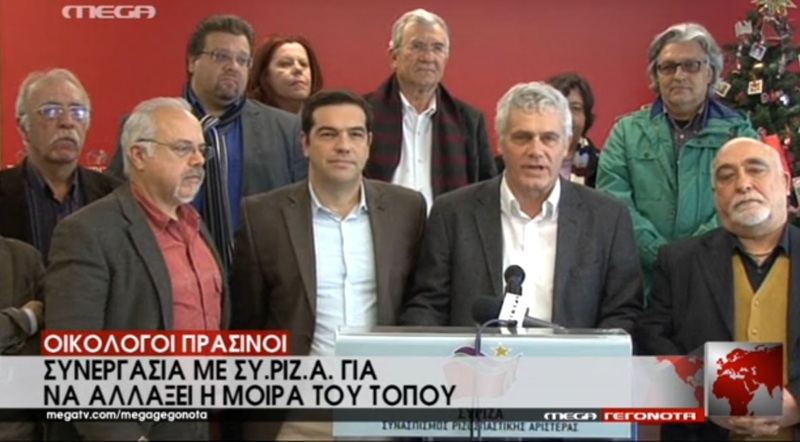 All of the 22 key points which had been set forward by Ecologists Greens as ‘green lines’ for possible collaboration earlier on in November 2014, at a national conference, were accepted by SYRIZA. The Ecologists Greens will attempt to elect its first MPs ever since 1989, when the first MP from the then Ecologists-Alternatives was elected. Although many suggest that the victory of SYRIZA and its allies have ‘locked’, Samaras is running a ‘negative campaign’, as there is very little if any at all he can be proud of during his tenure… The only certain thing is that the radical Left has a great potential of ruling Greece and possibly challenging the dominant neoliberal agenda in Greece and Southern Europe. As the radical Left approaches power, it comes closer to reality and maturity. Citizens across Europe and the world who have seen the mockery of democracy in the past 4-5 years should support the democratic will of Greek citizens and democracy itself. Citizens across Europe should start imagining a different Europe that serves its citizens and not its millionaires. ‘Project Europe’ is in danger not because of the radical Left’s possible coming to power but because of its current neoliberal political leadership. As for the Ecologists Greens, it remains to be seen whether they will live up to the historical moment in-the-making or whether they will behave in an immature political way. 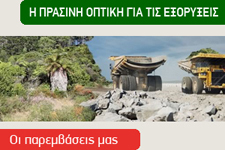 The terrain is new, the Ecologists Greens of Greece are a small party which has seen the creation of two splinter ‘green parties’, both of which target the center Left political audience. The Ecologists Greens have to play a pivotal role in bringing the European Green Party into the picture. The Greek ‘new paradigm’ has to be discussed, studied, enriched and ‘greened’! The big political space left by collapsing social democracy, now seen as equally neoliberal by the voters, has to be filled in. Green politics has to enter its adulthood and see the big picture. That picture should have a green background. Greek Helsinki Monitor (GHM) and Minority Rights Group – Greece (MRG-G) welcome the European Commission (EC)’s commitment to finally and belatedly publish before the end of 2010 the “Report on activities to improve the impact of policies, programmes and projects aimed at the social inclusion and non-discrimination of Roma people in the EU.” The report was prepared by the European Roma Rights Centre (with contributions by GHM and MRG-G for Greece) and submitted to the EC in June 2010: it included a synthesis report and 18 country reports (Austria, Belgium, Bulgaria, Czech Republic, Finland, France, Germany, Greece, Hungary, Ireland, Italy, Portugal, Romania, Slovakia, Slovenia, Spain, Sweden, and United Kingdom). The EC did not publish it even when Roma were in the headlines following France’s actions in mid-summer. Despite a published regret by ERRC for its non-publication, expressed in the Council of Europe High Level Meeting on Roma on 20 October 2010, the EC continued to withhold publication. For that reason, Greek Green MEP Mihalis Tremopoulos, who has consistently showed commitment to Roma rights, tabled a question to the EC on 4 November 2010. On 16 December 2010, in her answer, EU Commissioner Viviane Reding announced the forthcoming publication of the report: any other answer was indeed not possible… All related documents follow. The contract for this study was finally awarded to the European Roma Rights Centre (2), and according to the programme the study was to be presented to the Commission in May 2010. Has the Commission received this report, and if so, when will it publish it? The Commission has received the report referred to by the Honourable Member on activities to improve the impact of policies, programmes and projects aimed at the social inclusion and non-discrimination of Roma people in the EU. It intends to publish the report before the end of 2010. The works of the 6th Regular Green Ecologist Party Conference, held at Macedonia University in Thessaloniki from 26-28/6/2009, were concluded with the election of the party’s Panhellenic Council and the Executive Committee. The first meeting of the 34 member Panhellenic Council took place immediately after the end of the conference and it elected the 6 members that will comprise the Executive Committee, the central organ of Ecologist Greens, who have no individual party leader, president or secretary. The MEP Michael Tremopoulos was not included in the Executive Committee, since, after being an Executive Member for two consecutive years, he was not entitled to be re-elected. In this way the Ecologists Greens manage to allow all members to participate as much as possible, in more posts that involve responsibility. Decisions and other documents of the conference be published in a later post. 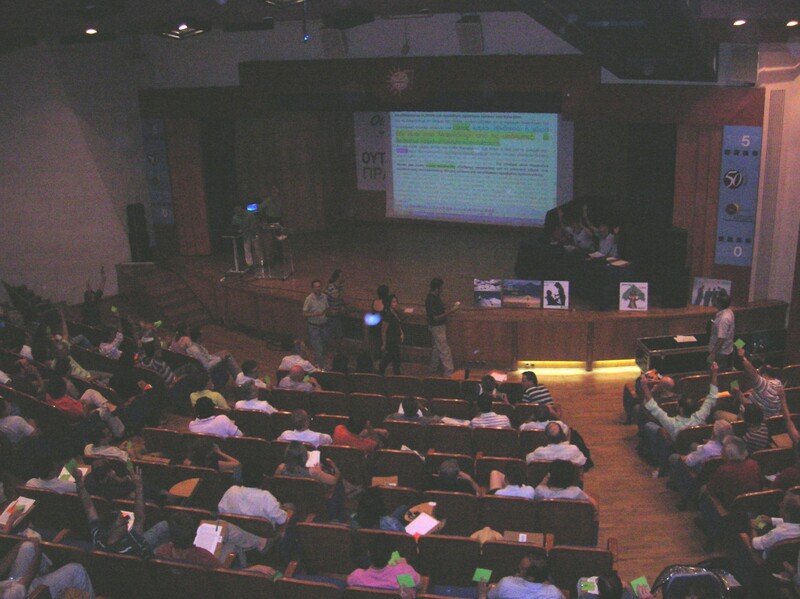 The works of the 7th Regular Green Ecologist Party Conference, held at Panteion University of Athens from 11-13/6/2009, were concluded with the election of the party’s Panhellenic Council and the Executive Committee.